Tomorrow (Tuesday) is the March screening of Age Concern Crosby’s popular Flicks & Friends film at the Plaza Community Cinema. 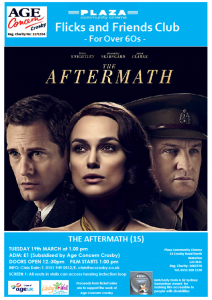 This month’s film is the newly-released The Aftermath which is a drama starring Keira Knightley, Jason Clarke and Alexander Skarsgard. It is directed by James Kent and is based on the novel of the same name by Rhidian Brook. The film is set in postwar Germany in 1946 and focus es on the life of a British colonel and his wife who move into a new home in Hamburg which is still being lived in by its previous owners – a German widower and his daughter. The film is a special seniors viewing for just £1 including tea, coffee and a biscuit. People are advised to arrive in plenty of time for a start of 1pm. This is a great opportunity to meet new friends.